Hello, I am new to this forum and got my first boat this spring. Hoping to get out on Rainy Lake this summer with my family after living here for 8 years. It needs a little work (a hole to patch and some gelcoat) but I am comfortable with fiberglass repairs. 1. Can someone tell me what I've got? It says 1962 on the title. It looks like the Crestflite Deville from that year, but it has the bow of a 1961 with the curves near the windshield. (Like LBJ's 1961 Crestflite). 2. Also picked up this 1960 Johnson Super Seahorse 40hp for $80. Can't wait to put it all together with the 63 kicker my friend donated to get us out on the water. Will 40 hp be enough for this boat? Re: Northern Mn - 1962 Crestflite Deville? 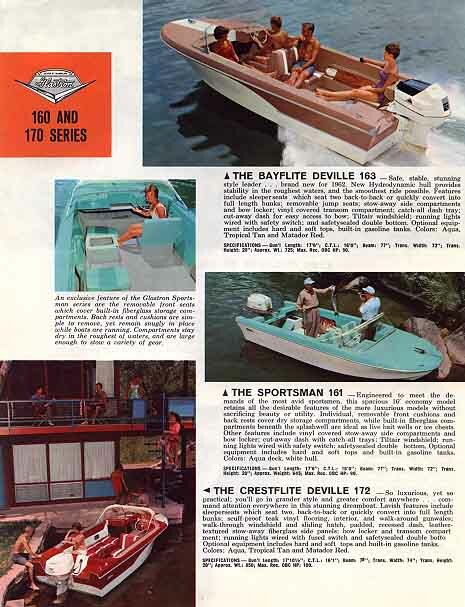 It still could be a '62 Crestflite Deville, here's a pic from the '62 brochure, bottom boat. And it says was available in tropical tan. Sure, they could use a mold for more than one year, most of the time the color or pattern would be different, or have slightly different options but could use the same hulls. See if you can find the hull serial number on the boat, probably stamped into the rubrail or on a small metal plate. The 3rd digit would indicate the year of manufacture. The interior looks like the Starflite Deville and it is 16.5"
I'll look as I clean it up. But your windshield has a walk-thru center and a sliding hatch, the Starflite doesn't. To my knowledge the Crestflite 17's and larger boats had the center step-thru. You just can't see the front dimples on the front sides very well in this picture. That 40hp will likely not be enough power. Maybe 15 mph with one person in the boat. That boat really needs AT LEAST 85hp but around 115 would be perfect. We had that same 40hp on our pontoon for 20 years and never did anything more than drain the gas from it every year and replaced the starter once. Pretty reliable. Very cool boat! I love the lines of that 62. We use to have a 67 V172 that we toured Voyageurs National Park up by you for a week a few years ago. It handles the big water pretty well. Welcome to the forum Wade ! Thanks, guys. I appreciate the responses and advice. Can't wait to get this boat into the water and get my family out on the lake. My son won't be letting me sit still this summer. At least now I can put a name to what I am working on: 1962 Crestflite Deville 172. That is in very nice shape. I agree, you're going to need more power! Nice vintage Johnson in any case. Likely the original?